VICTORIA, Canada—Some of the bigger items of the estimated 20 million tons of debris washed out to sea by the Japanese tsunami in March may have already begun arriving on the West Coast of Canada, according to a Seattle-based oceanographer. “My calculations show that it might have started to arrive in early November,” says Curt Ebbesmeyer, who tracks the movement of flotsam using computer models. He says the debris is likely to reach British Columbia, as well as Washington and Oregon around the same time. The massive debris field, estimated to be about the size of California, is composed of everything from parts of houses to vehicles to boats, as well as a raft of smaller items. “The big stuff comes in first, the little stuff will be another year or two out,” says Ebbesmeyer, who began studying the movement of flotsam in 1990 after 80,000 sneakers were swept into the ocean from a cargo ship. He has since monitored the movement of a wide variety of items that end up in the ocean, and specializes in forecasting the movement of sewage and oil spills, working on projects such as the Exxon oil spill in Alaska. 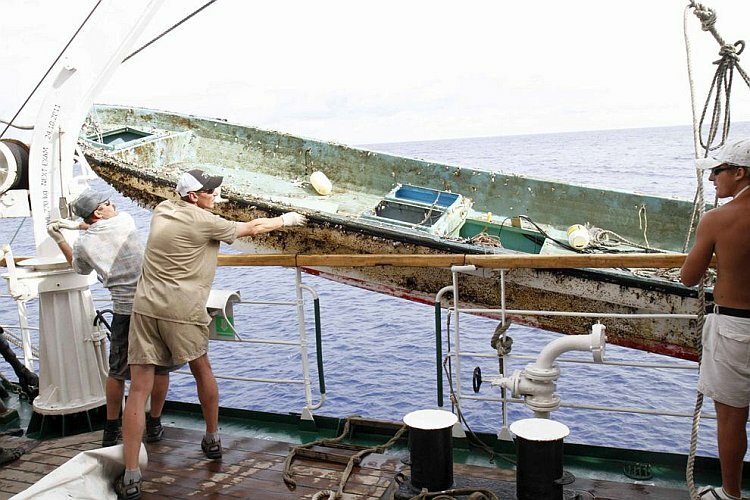 Using a different method, oceanographer Nikolai Maximenko and scientific computer programmer Jan Hefner, researchers at the University of Hawaii’s International Pacific Research Centre, have been monitoring the trajectory of the Japanese debris through computer models of ocean currents and ship reports. They estimate the bulk of the floating mass will reach the West Coast of North America around 2013. “Different pieces move somewhat differently, so it’s difficult to tell when the lightest objects will start to show up. It may be sooner, actually, but the main mass, the heaviest part, will probably come in 2013,” says Maximenko. 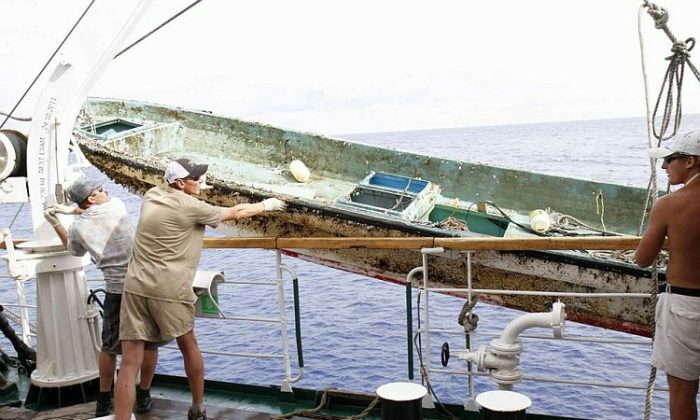 The researchers discovered their estimate of the whereabouts of the floating mass was accurate when the Russian ship STS Pallada recently came upon the debris on its homeward voyage from Honolulu to Vladivostok. “We keep sighting every day things like wooden boards, plastic bottles, buoys from fishing nets (small and big ones), an object resembling a wash basin, drums, boots, and other waste. 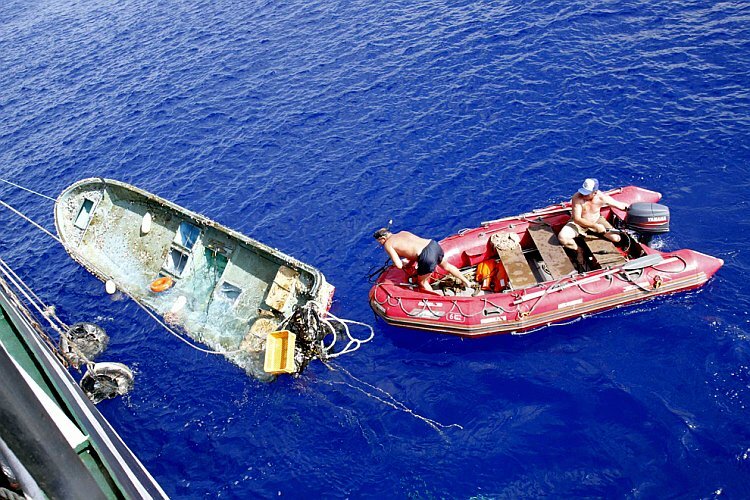 All these objects are floating by the ship,” the Pallada reported, according to a press release. The Pallada hoisted on board a small Japanese fishing boat that had been drifting along with the debris. The markings on the wheelhouse of the boat show its homeport to be in the Fukushima Prefecture, one of the areas hardest hit by the tsunami. “There was a hope that most of debris would sink down, especially lumber, wood from broken houses. But unfortunately we see it floating, as reported by the Pallada,” says Maximenko. The magnitude-9.0 earthquake that struck Japan was followed by a tsunami that swept away entire towns in its path. “It’s just unimaginable—it’s as if 400 miles of the Japanese coast was shredded and put out on the ocean,” says Ebbesmeyer. While a large percentage of the debris will get sucked into the Great Pacific Garbage Patch—a gigantic gyre of marine litter in the central North Pacific Ocean—the amount expected to reach the West Coast is still considerable, says Maximenko. He predicts the first landfall will be on Midway Atoll in the North Pacific. What misses Midway will continue toward the main Hawaiian Islands and the North American West Coast. The debris poses a threat to small ships and coastlines and may also introduce alien species into North American waters, Maximenko says. Ebbesmeyer is asking beachcombers along the West Coast who spot any unusual floating debris to contact him through his website at flotsametrics.com.